Software applications on CICS could be conversational or pseudo-conversational. 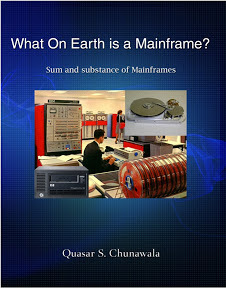 A pseudo-conversational program efficiently utilizes mainframe computer time. A conversational program : Say, you want to want to reserve a railway-ticket from Mumbai to Pune.Type the TRANSID BOOK on the terminal. The booking software program starts running, and the MAIN MENU is displayed on the screen. Whilst you glare at the screen and decide what option (1,2 or 3) to type next, the program is still running, holds on to resources, stays idle waiting for response, wasting mainframe computer time. Human response(10 seconds) is far slower than CPU processing time(2 seconds). You key in option 1, the software program processes the selected option and displays BOOKING MENU on the screen. As you fill in the passenger details, the software program is waiting idle, till you press enter. Thus, conversational programs are inefficient and waste resources.